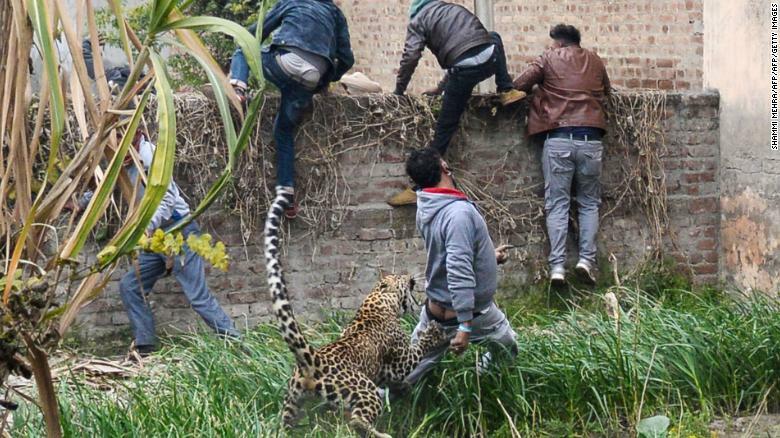 A panicked leopard attacked five people Thursday as it went on a rampage through a village in the northern Indian state of Punjab. 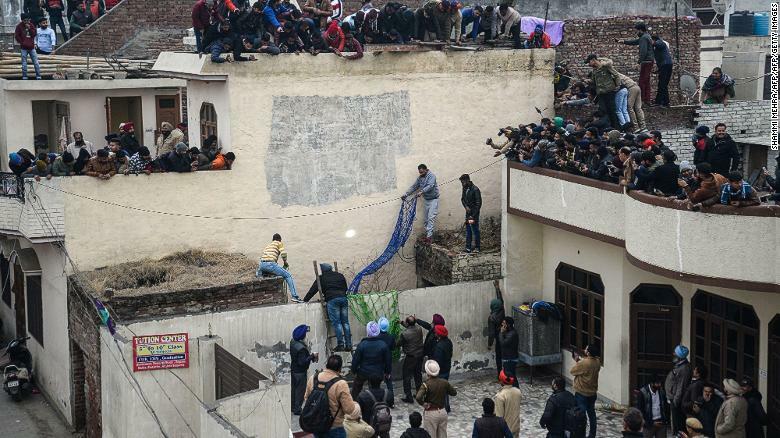 Hundreds of people collected on the roofs of their houses in Lamba village in the city of Jalandhar as they watched the leopard sprint across narrow streets, attacking people in its wake. “There were a lot of people. That is why it was getting aggressive. The area was very congested, very narrow lanes. It became so difficult to catch it,” Khushwinder Singh, a local forest official, told CNN. A leopard attacks an Indian man as others climb a wall to get away from the animal in Lamba village, on January 31, 2019. At least four people were injured over a period of more than seven hours as officials tried to catch the animal and tranquilize it. Forest department officials stalked the leopard through the village and trapped it in a house. Several hours later, a veterinary team arrived from a nearby zoo and took the leopard with them. Forest Department workers try to catch a leopard that has attacked residents in Lamba village, on January 31, 2019. “There was just so much panic and we were scared that there may be damage to someone. The people are important but the leopard is important as well,” said Singh. Deforestation and the encroachment of human habitations have resulted in increased contact between people and animals in rural India. In 2011, the government issued guidelines on managing human-leopard contact, noting that leopards are a highly adaptable species and capable of living in close proximity to urbanized areas. 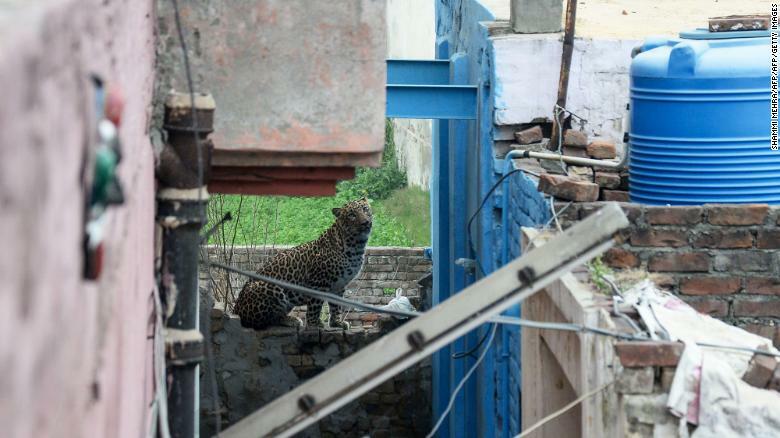 A leopard that has attacked residents is spotted near a house in Lamba village on January 31, 2019. “Incidences of leopards ‘straying’ into settlements causing human causalities, and the retaliatory killing of leopards by the public have been on the rise,” said the report’s authors, though they did not provide a specific number. A 2016 government estimate put the total number of leopards in India at between 12,000 and 14,000.